Pictures of the proposed new home kit have since filtered onto social media and although they remain unconfirmed, fans are impressed with what they have seen. The leaked new strip appears to turn back in time to Liverpool’s golden era of the 1980s. Still predominantly red, a tinge of yellow and white has been added for historical effect. One of the leaked photos show Virgil van Dijk and Alex Oxlade-Chamberlain modelling the kit. 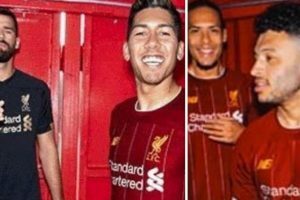 While another shows Brazilians Roberto Firmino and Alisson posing in their new jerseys. The goalkeeper’s shirt is black with gold print for the crest and sponsoring. Supporters on Twitter were very impressed by the new design ahead of the launch. “The new Liverpool home kit absolutely rules. Nike better dish out the big bucks,” one fan tweeted. “New Liverpool kits look unreal,” another added. “Liverpool 19/20 kit is thing of pure beauty,” a fourth put. The club’s deal with the American sportswear brand is set to expire at the end of next season meaning this could be their last Reds design. Liverpool are said to be in advanced talks with Nike over a new long-term kit deal which is expected to surpass the value of Manchester United’s £750million deal with Adidas. Jurgen Klopp’s side will look to reach the Champions League semi-finals tonight, they carry a 2-0 lead to Porto.